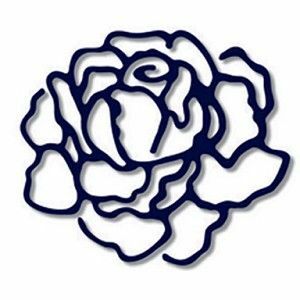 Hello Connie here today with a country rose. 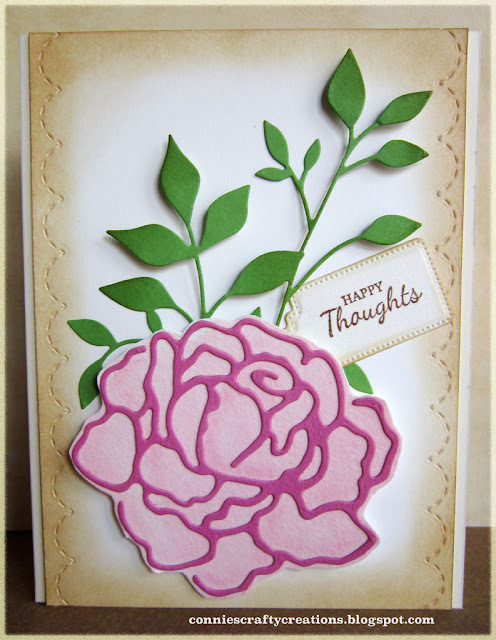 Today I am sharing the Die-Namites Rosy Rose, I started off with watercolor paper and using Spun Sugar distress inks on my palette with a waterbrush I added the distress ink to the paper the size of my rose die cut. Die cut the rose out and glued it onto my water color paper as soon as the paper was dry. Then I cut around the die leaving a little border around the die. I decided I wanted a little more contrast in the color so I added some pink chalk inside to give the look of a little more dimension in the rose. I then cut a 4" by 5 1/2" piece of cardstock and added one of the Memory Box Country stitches dies for my borders. You know I had to use some Distress inks in Antique Linen to shad around the edges. 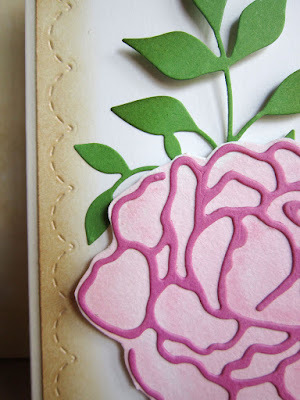 I used foam dots behind the Memory Box Fresh Foliage die and the rose die when adding them to the card. I finished it off using a Poppystamps Pinpoint Main Street tags die , with a stamped sentiment from Taylored Expressions many mini occasions sentiment stamp set. Here is a closeup of the rose and the stitched border. Here are pictures of the dies I used with the links above in the description. Wow! They looks great.Beautiful color. Beautiful card Connie, I love everything about it! The stitched border makes a pretty frame to your gorgeous rose. LOVE your beautiful layered rose, it gives off such a Vintage vibe. The stitching frames your card nicely and I always adore a tag on a card! Very Pretty! This is so pretty Connie! I love the stitching around the frame and that lovely layered flower!! Beautiful card design, Connie, and such a lovely nature-laden masterpiece! Gorgeous flowers! I am using that Main Street tag die set on another project and find it the perfect layering tool! So glad to see how wonderfully it works with sentiments. Sweet and Delightful! Thanks for starting my day off with your pretty artwork! I especially like your inking around the edge of the card for the vintage look. Great color combo on such a pretty card. WOW what a beautiful creation Connie! That rose just POPS! Awesome designing inspiration ... thanks so much!